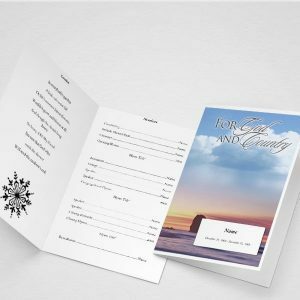 Obituary Template allows you to get quickly started for creating printable obituary programs for funeral service arrangement. 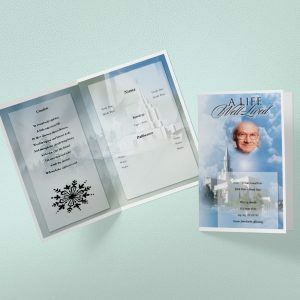 QuickFuneral.com presents online obituary template to edit online and download printable PDF. Just open any obituary template in editor and start customizing by adding your own contents. 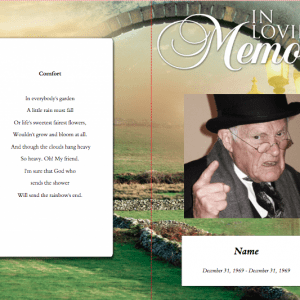 Obituary Template – Also known as obituary samples or obituary example. 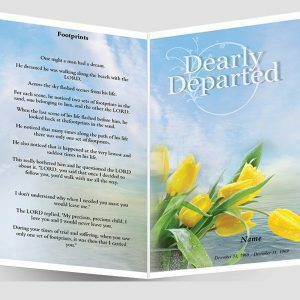 Traditionally, an obituary refers to a written description of a person’s life and when and where the services will be held. It explains their birth date and place, death date and place, family, life accomplishments, personality, and includes the date and time of the memorial service. 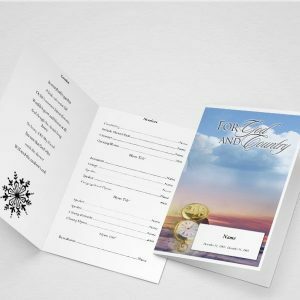 Over the last few years, people have also been calling the printed order of services that is handed out at the funeral, “the obituary”. This website article will focus on the printed version of the obituary template more than the written obituary. 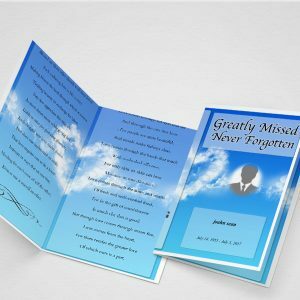 Often, the written obituary is included in the printed obituary template as well. 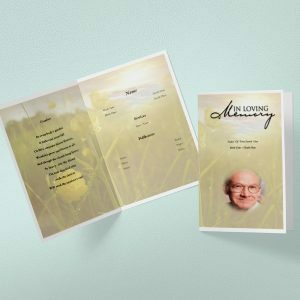 Written Obituary Template – The written obituary template listed below is more of a traditional and generic obituary template but you can convey the necessary information for the funeral in creative ways that will convey the personality of the person that has passed on. 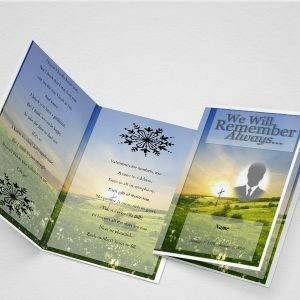 These days, custom obituaries are becoming more and more popular because they help celebrate the life of the loved one that has passed on. 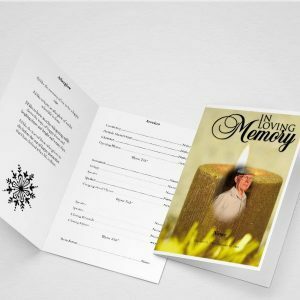 You will find this obituary template listed below in the application as well when you insert a text box into your project. “Full Name”, “Age”, resident of ”Place of Residence”, died/passed away, “Date” “Location of Death”(example: at his home) from (can also include optional cause of death, example: natural causes, heart attack). “He/She” was born in “Place”, “Date of Birth”, the “Son/Daughter” of “Father First Name and Mother First Name and Last Name”. “First Name” attended “School Name” and received “Degree” or “Graduated in” “Name of Degree”. “Name” was married to “Spouse Name” on “Wedding Date”. “He/She” was survived by “Spouse”; “Number of Brother/Sister and their Names”; “Number of Children and their Names”; “Number of Grandchildren and their Names”; “Any other Relation to Family”. 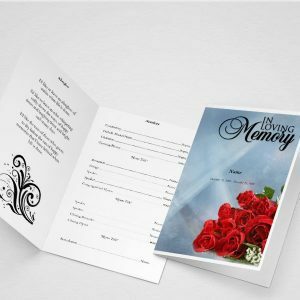 These type of cards are also known as funeral bulletin, funeral memorial programs, funeral templates, funeral service programs or memorial service program and are used to supply information to those that are in attendance at the funeral and usually lists the order of events, pallbearers, special poems and verses, and anything else that the family wants to include to make the service a memorable experience. Our online software allows you to easily create 100% custom in minutes while still keeping the desired quality. The application allows you to choose from hundreds of background templates we provide and also has the ability to upload your own background of your choice. Unlimited pictures and text boxes can be uploaded or inserted to your project as well and can be dragged and dropped anywhere on the page. 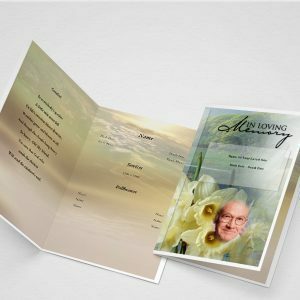 The application uses new online HTML5 technology that enables the software to auto-save every change you make to your beautiful funeral program. This also means that you can access your project on any computer in the world – Mac or PC so you will never have to download the software. 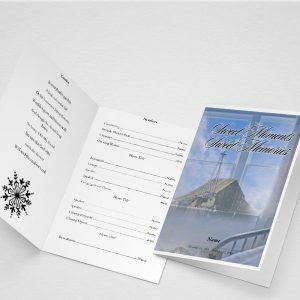 Funeral programs templates come in many different sizes. The most popular sizes are the 1-up (8.5 x 11 sheet of paper folded in half) and 2-up programs (print two programs on an 8.5 x 11 sheet of paper and folded in half). The finished size for the 1-up programs when folded is 5.5 x 8.5 and the finished size for a half-page funeral program folded is 4.25 x 5.5. Either size can be created with or without a border (this is only an option if you choose to have your product printed at a local printer).